Thirty years ago Mary Miller was studying nursing and working as a personal care assistant to Darcy Pohland, a Twin Cities reporter who had broken her neck in a diving accident. When Miller called for medical supplies, she would often have to wait two weeks for delivery. When a wheelchair needed repair, she was told it would be a month-long wait. Upset at the length of time it took for services and products to be delivered, Miller thought there had to be a better way. “If you think you can do it better, do it yourself,” her grandfather told her. 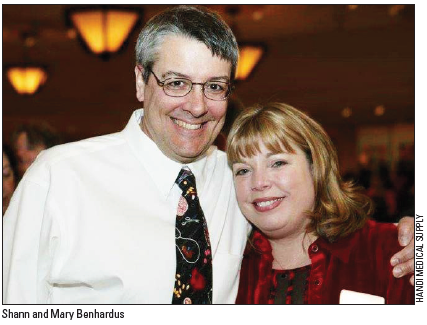 He loaned her $15,000 to start Handi Medical Supply in Golden Valley. That business has expanded to 110 employees, a central location at 2505 University Ave. W., St. Paul and a Mankato branch. But the mission to enrich lives is the same one Mary (Miller) Benhardus began with. 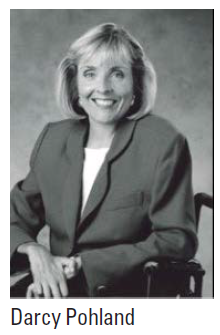 She and her husband Shann co-own the medical supply company that has endured and prospered over the past three decades. Handi hasn’t forgotten its roots, as three conference rooms are named after people who have made a difference in company history. One honors Mary’s grandfather, who loaned her the money to start the business; one is named after company inspiration Pohland, and one is named after Charlie Smith Jr., founder of Access Press. The showroom of Handi Medical Supply is expanding from 5,000 square feet to 10,000 square feet once remodeling is done, said Laurie Tomaszewski, chief marketing officer. She was hired as a respiratory therapist 13 years ago. Requests for supplies typically come through a clinic, a transition care unit or a home care nurse. With a larger showroom, more client people can view a needed product and pick it up or have it delivered that same day. Handi recently started its Handi Home Living Solutions division to provide home modifications. “We do so much with complex rehab and wheelchairs,” Tomaszewski said. “If people have a chair and need to get in and out of their home, we remodel the home, do the bathrooms and showers.” An assistant technology professional visits the home to see what is needed. “We think the right thing to do is to have people who are properly trained so we can help people to be well and be safe in their homes,” Tomaszewski said. Keeping any business growing with the same owners and name is a feat in itself, but another challenge are Medicare regulations. A concern is that the regulations affect product quality, a key focus for Handi. “It looks like this program may be going away next year, but Medicare is not willing to do anything with the pricing. I think Medicare has been hearing there are access issues, and some people have been waiting for weeks to get items. They need to do something, but will it be enough? A lot of small businesses have had to close their doors because of what Medicare has done.” But Handi has persevered. Many of its employees have been working for decades. “Five years ago we won the Better Business Bureau Integrity Award, and we were nominated again this year,” Tomaszewski said. A strong focus on supporting and rewarding employees is paired with an equally strong focus on clients and disability groups. Handi recently raised about $10,000 for the National MS Society through a golf tournament. doing the right thing for the customers and our employees,” she said. “Sometimes we are not making much money on our products, but we are doing the right thing.” She said quality brand names are important, as is informing customers about product use. What has been the secret to Handi Medical Supply’s success for the past 30 years? “We feel like we’re doing the right thing,” Tomaszewski said. When I opened our recent Access Press issue (Sept. 10th 2018) the front page article immediately drew my attention. One seldom reads about a medical supply company that earned bragging rights. It told the story of Handi Medical’s beginnings and their mission to help their many unfortunates customers. The company is doing so well over all those years and went through a drastic expansion and had to increase their staff to 110. When I turned the page to read the rest of the article I was surprised by the staff picture. I could not see a single staff with an obvious disability! Just wondering how this fits their mission statement.